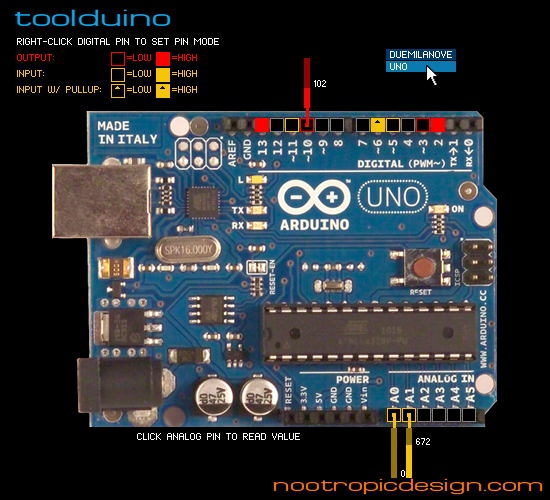 Toolduino is a simple software tool that lets you easily interact with your Arduino hardware so you can test the circuits you create. 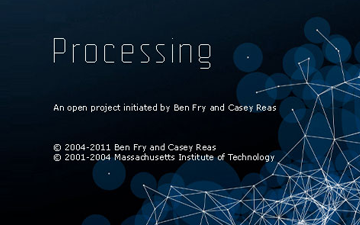 Toolduino is written in the Processing languange and is available for Windows, Mac OS X, and Linux. Toolduino uses the the Arduino library for Processing to communicate with an Arduino board so you can manipulate output pins and read inputs. The Arduino must be running the Firmata firmware that comes with the Arduino IDE. Toolduino is not for use with your own Arduino sketch — you must upload the StandardFirmata sketch to your Arduino before starting Toolduino. IMPORTANT: The version of the Firmata library distributed with Arduino 0017 is broken and will not work. Make sure you are using Arduino 0018 or higher. First, you must load the Firmata firmware onto your Arduino board. Open the sketch StandardFirmata in the Arduino IDE. Open File -> Examples -> Firmata -> StandardFirmata and upload it to your Arduino board. 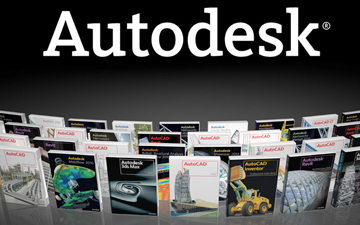 Then start the Toolduino application. Toolduino is a Java application (because Processing is really Java under the covers), so you need to have a Java runtime environment (JRE) installed on your computer. Most computers have Java, but if you aren’t sure or want to install it, go to java.com to get it. After connecting, using Toolduino is easy. Right click on a digital pin to set its mode: OUTPUT, INPUT, INPUT with pull-up resistor, or PWM output (available on pins 3, 5, 6, 9, 10, 11). A digital input pin shows its value HIGH or LOW. Left-click a digital output pin to toggle it between HIGH and LOW. A PWM pin shows a slider you can use to set the value between 0 and 255. Left-click an analog pin to read its value. 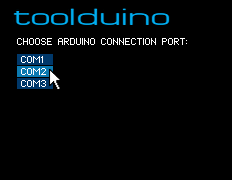 NEW FEATURE in Toolduino 1.1: Toolduino now lets you choose which board is displayed. Right click anywhere (not on a pin) and a menu of boards will be displayed. Duemilanove and Uno are supported, but send me good images of other boards and I will add them! 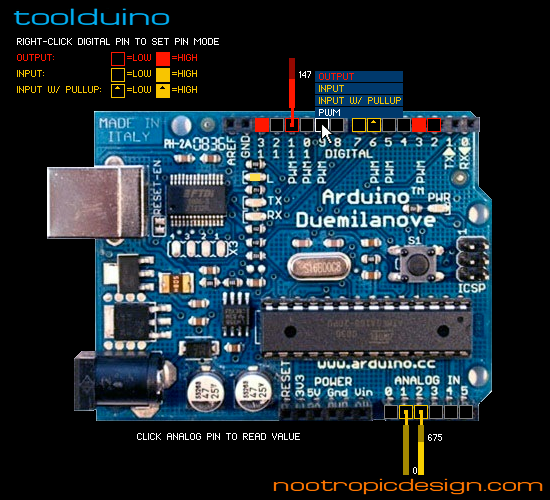 For discussion/questions/bugs see the Toolduino forum. If there is no error message displayed, and Toolduino does not seem to be communicating with the board, you are probably using a broken version of the StandardFirmata Arduino sketch. The version distributed with Arduino 0017 is broken (see important note above). I got a report that the Arduino processing library does not work with Arduinos that use an alternative bootloader like Lady Ada’s ADAboot.